In our aging society, the incidence of prostate cancer will continue to increase, and improvements in detection and treatment of this prevalent yet extremely treatable and curable disease are needed. Research into new molecular markers described in this chapter is especially promising. These markers will improve specificity and sensitivity of screening and will serve to supplement or supplant current prostate-specific antigen screening. 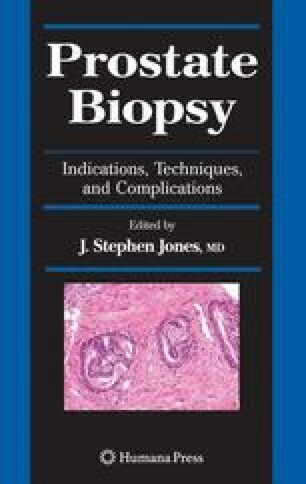 Targeted biopsy utilizing new radiographic techniques such as Doppler ultrasound, magnetic resonance imaging, and magnetic resonance spectroscopy can reduce the number of needle cores and improve pathologic specimen quality. Improvements in anesthetic agents and techniques decrease discomfort and improve patient readiness to undergo prostate biopsy. As emerging research continues to elucidate the pathology of prostate cancer, diagnostic screening expands into genetic and even viral etiologies that may offer the possibility of a vaccine against prostate cancer.